After such a heavy post the last time round, I figured it’ll only be right if I blogged about something more positive this time round. I’m also frustrated with myself for being unable to write an article that doesn’t exceed the word limit I set for myself everytime. It bothers me a lot, so this time round, I’m going to try a more informal type of writing, let the pictures do the talking and see if it helps with the word count issue. I recently (at the point of the first draft, which was two months ago) discovered this absolute gem nestled near the northern borders of Singapore. While Punggol Ranch isn’t exactly a downright doppelgänger of Texas, it does have many things in common, at least on a stereotypical level. With my ten-week semester break coming to an end, I got a bunch of friends (Imran, Aaron and ODS) together and stayed over at this gorgeous settlement for a night. The lot of us were assigned a wagon for about $200 per night (the one that sleeps two costs about $20 lesser), which surprisingly turned out to be rather spacious. There was a queen sized bed and a single bed in the main room, along with cups, a television set, some western-themed furniture and a very interesting digital fireplace that was unfortunately broken during our stay. There were ‘log tables’ and ‘log chairs’ in the ‘backyard’, allowing you to either hold heart to heart talks or play a bunch of board and card games while being engulfed in a magnificent ambience. The bathroom was actually bigger than what I expected. It’s clean, simple and way brighter than the main ‘room’ itself. 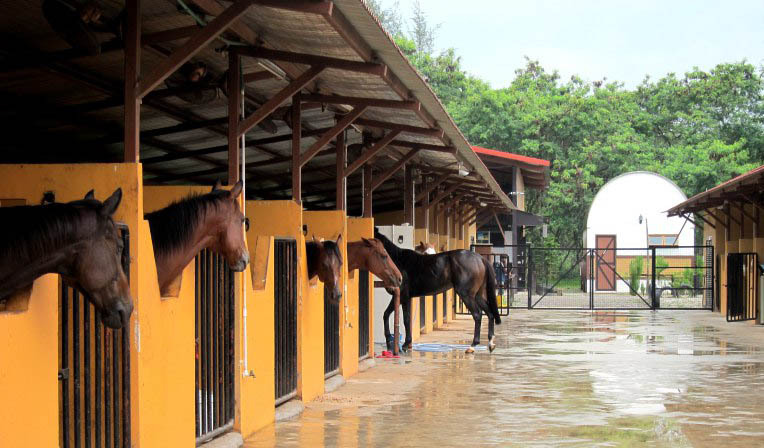 The ‘town’ also houses horse stables, and you could spot fields for horse-related activities as you walk around. Every wagon comes with three complimentary five-minute joyrides around the back lanes of the place, but you could cough up a sizeable sum of money to live out your Indiana Jones fantasies for hours. As it was a public holiday when we went to ride the horses, the queue was pretty long. Luckily though, the little children in front of us weren’t tall enough to ride on the stallion (they had to settle for the pony), so while there were about 20 people in the line, me and ODS only waited for about 20 minutes. Nonetheless, it was still great fun. I feel weird saying this, but the posterior of the horse was so firm and muscular. Ya’ll should feel it if ya’ll have the chance to ride on one; or not, it’s your choice. Either way, you’ll still be more courageous than Imran and Aaron, who were, in genuine animal terms, chickens. Aaron was supposed to help me take a picture, but he didn’t, so eh, here’s a picture of ODS instead. After the ride, we bought a pack of carrots for $2 and fed it to the horses. Besides the two eateries, Bacon & Booze and Curry Garden, which, by the way, has a lovely outdoor dining area, the rest of the resort was pretty much the same. The seemingly monotonous consistency can only be appreciated when you’re physically present, unplugging yourself from the poison of social media and breathing in the wonderful country air that encompasses your surroundings. While it’s great to be a loyal villager and enjoy the peaceful scenery, one eventually has to foray out for seafood, the thing most commonly associated with Punggol behind lalang fields and bridges made up of distorted rectangles. Since Punggol Settlement was just a short one-minute walk away, we indulged in scrumptious yet affordable crabs for pretty much every meal. I couldn’t remember the place we dined at, but there were a couple of restaurants offering 50% deals on their crabs. Just pick one, take the outdoor seats for goodness sake and watch the sunset or enjoy the cool evening breeze. Over the two days, we tried three flavors of crabs; butter, black pepper and garlic and onion, and it costs around $25 for a hearty 800g serving. Down the stretch, you can also find the famous and heavenly Sembawang White Bee Hoon, a must-try dish for just about everyone. Not far away lies Punggol Beach, a relatively quiet area with plenty of rocks and heavy freighters lining the diminishing horizon. It was extremely vacated when we were there, making it a great place to lose your thoughts and just unwind after a long day at school or work. There was also a jetty nearby, and a sandbox-playground further back. A ‘chalet’ wouldn’t be a ‘chalet’ if there weren’t any cycling, so we decided to rent some bikes overnight from one of the shops along the Settlement to explore the Punggol area. Halfway through tho, some wisecrack (me) suggested that we should cycle to our alma mater, the School of Science and Technology, Singapore, in Dover, which was about 32.5km away from our location. Now, I’ve never tracked my cycling distance before, so I had absolutely no idea how far a distance 32.5km really was, and the failure to expect uneven terrains didn’t help my cause either. Miraculously, after six hours, two whole hours behind our schedule (well technically, I forgot to factor in time for breaks), we finally reached our beloved secondary school. It was truly a phenomenal experience, cycling past weird eateries and exploring the secluded streets. The parks of Punggol were just indescribable by the way; their beauty were simply astounding. I could only imagine the amount of planning and manpower which transformed one of the least developed parts of our island into an indisputable future city. The taxi uncle summed up our journey pretty nicely… “what the hell were ya’ll thinking”? Anywho, our initial plan was to cycle all the way back after we’ve reached, but considering how it was already four in the morning, we decided to just grab two cabs, stuffed the bikes inside and made our way back to our wagons for a well deserved break. Mind you, this was supposed to be a relaxing staycation. Looking back now, the journey was somewhat life-changing, and it’ll certainly make for an excellent story beside a working fireplace someday. I thought Punggol Ranch Resort was unquestionably one of the best places I’ve visited in my life, even though it was located in my own country. The whole place didn’t resemble nor remind me of Singapore at all, and to think that it costs less than your typical East Coast chalet or Changi bungalows? Frankly, this place blows my mind. In most places when you take a staycation, the tense hustle and bustle of the city can still be felt, but over here, the atmosphere was veritably relaxed. There was no one rushing around, the pacing around here seems gratifyingly slow and most importantly, the structures and intricate attention to detail provided a remarkable, one of a kind experience that I thoroughly enjoyed. There was also an abundance of food nearby, paired with great sceneries that accompany you wherever you go. Little Texas, I’m going to miss you. What is the most unique place you’ve ever stayed in? Share your experiences with me in the comments sections below! Really nice article to read, straight to the point and easy to digest. Also, nice to hear about your cycling experience as well and glad you had a great time there. Thank for the article. Thanks for your kind words Sam! Glad you enjoyed the article. Hey! You’re very welcome. I’m glad you enjoyed reading this!